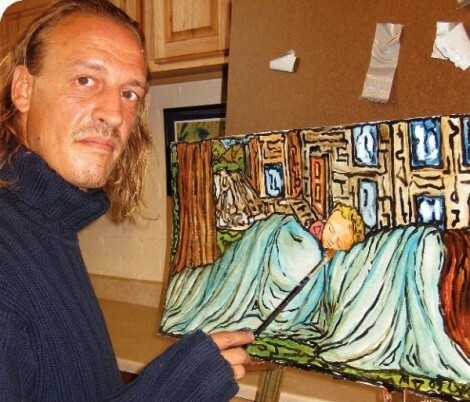 Home Where You Are: Artist Mark Vaynshteyn explores homelessness from his own experience. The poor and destitute have long been subjects for art. But aside from Van Gogh and a few others, few painters have explored the experience from having been homeless. Ukrainian-born Mark Vaynshteyn has lived it first-hand. The 37-year-old was drawn to the brush at a very early age and, at 13, was able to make enough money selling toys on the streets of Moscow to enable his father to quit one of his jobs. In 1988, Vaynshteyn came to America with his father and earned a Bachelor’s of Fine Arts at the School of Visual Arts in New York City. They continued to Paris, where he had more than 300 exhibitions. He traveled around Europe, also showing in Barcelona, and helped manage the Joyce Club in Paris, which featured art and live music. But then, his fortunes turned. He attempted to travel to Spain with his then-girlfriend, Margarita, whom he had met in Paris but was held at the Spanish border for overstaying his visa. He was released to his father but then deported to New York City. Margarita flew to meet him there, where they were married. The two traveled to Salt Lake City, where Mark had lived with his family in the early 1990s, and Margarita gave birth to their daughter, Zinaida (“Zeena”), delivered by Mark at home. They returned to New York City, but without a birth certificate, the child was not legally recognized, and they returned to Salt Lake City to try to register Zeena. A friend who had promised to meet Mark here never showed up, and he was robbed of all their money. That was all it took to make them homeless. The family stayed at The Road Home shelter in downtown Salt Lake City for a while, but Mark didn’t find the conditions very suitable to family life, although he has seen individuals and families become accustomed to it. One day, the facade of the Holy Trinity Greek Orthodox Church, where he had been baptized, struck a chord in his memory, and he went inside to talk to Father Matthew Gilbert, whom Mark says went out of his way to help the family secure a small studio apartment. Mark got work restoring murals at Sts. Peter & Paul Orthodox Church, north of the Main Library. Then, across the street from The Road Home, he found Art Access. “Mark walked in one day last September,” recalls Art Access Gallery Director Ruth Lubbers. Mark remembered that his parents, Vladimar and Valentina, had exhibited work there in the early ’90s. 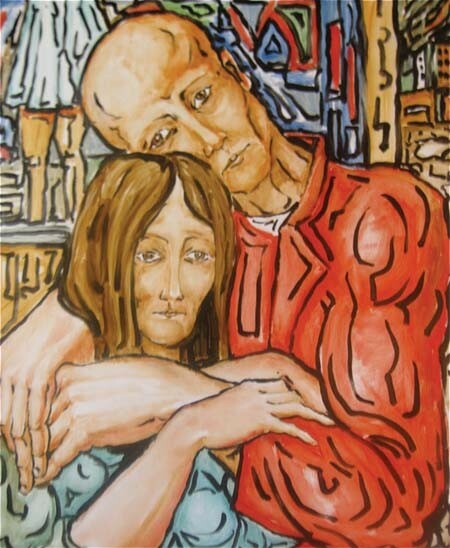 Mark showed Lubbers some of his paintings, reminiscent in their heavy lines of the work of French painter Georges Rouault, who had apprenticed with a stained-glass maker. Besides seeing the quality of his work, Lubbers is enthusiastic about hosting his show at Art Access, a nonprofit dedicated to providing art opportunities to the disabled. “We’re so happy he came in here,” she recalls. “He has an amazing story.” Art Access allowed him to use space in the back of the building to paint works for this show and donated material. The gallery will host a second opening for the exhibition on Dec. 4. These 19 works recall the icons of his birthplace as well as the stained glass of the cathedral. The common theme of the portraits, in oil on matte board with emphatic colors and definitive lines, is a stillness and reverence for the subjects. Mark has an unusual perspective on homelessness. “What is the homeless problem, and for whom is it a problem?” he asks. “Quite a few of these people are happy. Some get into trouble, and some are in crisis, but look at the library, where they hang out and socialize.” He notes that many of the homeless population in Salt Lake City feel a sense of community and help each other out, sharing food or what little money they have. In comparison to New York City, where the homeless are inconspicuous, he finds the homeless in Salt Lake City stand out in the small area in which most of them are concentrated. Margarita’s visa will expire in February, and she will have to return temporarily to France. The couple is hoping to have Zinaida baptized before then; otherwise, the 19-month-old will have to stay in Salt Lake City with Mark for a time.